As you know, I like recipes that can be kept in my head. That is one of the things I learned when I worked in a bakery many years ago. The best way to keep a formula (recipe) handy is to know it in percentages and just memorize them. It also helps if that formula consists of a handful of ingredients. In baking, almost all the basic products involve the same few ingredients. They are either lean, as in breads, or rich as in pastries and cakes. Cakes are the richest of baked products as they typically have flour, sugar, eggs and butter and some have dairy products such as milk or cream. The easiest cake to make is also the secret to dozens and dozens of desserts: pound cake. People armed with that simple, old fashioned recipe can make a cake anywhere. In fact you don’t even need to have a special pan. With that ratio of 1:1:1:1, you can beat a batter and pour it into any receptacle that you can bake. If you look at that formula, you will notice that you would end up with a four pound end product – which would be quite a big and heavy, dense cake. Once you know this, and remember to use an oven at somewhere between 350F and 400F, and make sure you grease your pan or mold with butter or spray-on shortening (preferably purchased at Whole Foods, so you are not getting toxic hydrogenated aerosolized fats), you can start to have fun with this. I would add vanilla to this recipe. *Also you can substitute almond, Gluten-free, or coconut flours or a mix of these so you can avoid wheat allergies altogether. 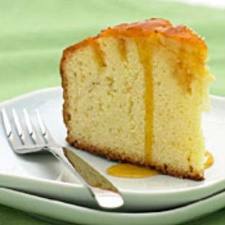 One of the best things to do with a basic pound cake that has been made from gluten-free wheat substitutes is infuse it with a flavored simple syrup (directions below) and top it with whipped cream beaten with fruit or a “fool”. Technically English “fool” is a custard mixed with fresh fruit. But you can skip the complication of making custard and just mix the fruit with whipped cream (make sure it is real whipped cream, not Cool Whip or emulsified hydrogenated oil). You could also make the fool with Greek yogurt or ricotta/farmer’s cheese. 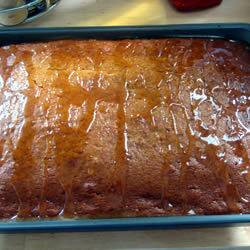 So, for example, I like to make a one pound loaf cake, infused with lemon simple syrup and topped with raspberry fool. But the possibilities are endless. 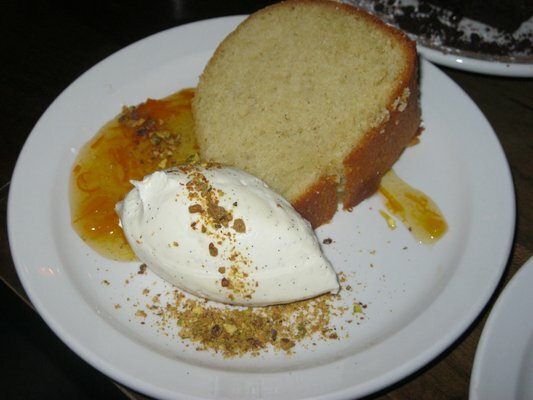 Another variation is plain pound cake, flavored with pumpkin pie spice or mace (the delicate outer skin of nutmeg), infused with orange syrup, topped with whipped cream beaten with raisins or chocolate shavings. Something I like to do in the summer is find Pumelo, usually at Asian markets. 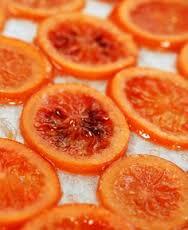 Pumelo are an exotic citrus fruit with a flavor that cannot be compared to any other citrus. It is almost perfumy in a floral way and is both delicate and delicious. When I find them, I make a large jar of rosolio, or baking liqueur to use throughout the year; I will discuss these next Sunday. This is an inexpensive dessert that looks far fancier and more complicated than it is. It is very dense and rich, so a little goes a long way. Here are the general directions for a small, one pound loaf. It is preferable to measure by weight not volume, if you can, with a scale, otherwise, use the measurements on a large Pyrex measuring cup. Ingredients: Everything at room temperature; you will need a long wood or bamboo skewer or other piercing instrument. Toothpicks will do in a pinch. Bake for about 50 to 60 minutes, checking to see if a toothpick or wooden skewer in the center, comes out clean. Cool the cake in its pan for a minute on top of the stove and then pierce neatly and cleanly all over the surface of the cake. Fool: 2 cups cold whipped cream and one cup of golden or dark raisins+, softened in some hot brandy or some of the orange syrup and drained well. Refrigerate the raisins or pop them in the freezer for a few minutes to chill them quickly. Fold the raisins into the whipped cream just before serving. 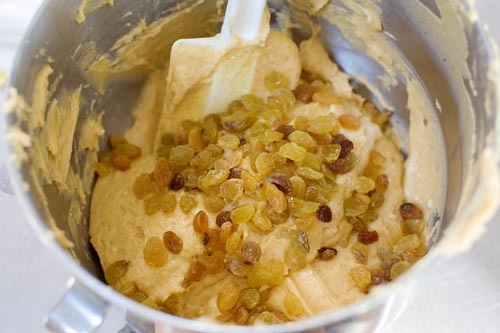 +In baking, always soften raisins in hot water or some other hot liquid to reconstitute them before they are baked or served, to avoid them becoming too hard. Make sure they are drained well before adding them to the product. Pour the still warm syrup over the still hot pierced cake. It may seem like too much, but it will absorb into the cake. If there is excess liquid, you can add a bit of cream and powdered sugar to it, to make a quick glaze to decorate the plate. Unmold the cake from the loaf pan when it has cooled completely. Top each piece of cake with a candied orange wedge, standing up in the fool to finish the decoration. 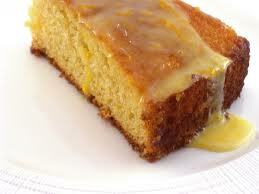 I love pound cake! One of the many things I miss from the pre-celiac days. I will have to try one using a different flour sometimes. Of course I have yet to try any of your recipes out, but as we know when it comes to cooking, I am lazy. I just ate gnocchi yesterday for the first time in forever, because I found some gluten-free at my grocery store. I was so excited! I love gnocchi (potato dumplings with pasta sauce,what’s not to love?) and would literals checked the pasta aisle every week looking for a GF version, because it seemed like it should be easy enough to make. Yesterday my prayers were finally answered! Of course I ate so much of it I felt sick afterwards, because it’s so filling. Well, in truth I also got excited to find lactose-free egg nog (there are no words for how much I love egg nog – alcohol free of course) and drank a big glass of it right after eating the gnocchi. Bad idea. *literally, not literals. Stupid spell check. Geoff’s mother is from Switzerland and there they eat gnocchi (they call it something similar, but I forget what the word is) with browned butter and gorgonzola. That is a great way to eat it but brother is it rich! I cannot figure out how, but his grandmother was a skinny little thing and it seems butter and cheese and rich desserts were her staple. Sigh. I like to make ice cream out of egg nog, oh and pancakes. Wasn’t there some book years ago about how the French eat such rich food and stay so thin? I seem to remember that – I realize the Swiss are not French of course, but I bet the idea is the same. They eat small portions and are physically very active, as well as experiencing MUCH less stress than your average American. And Starbucks make eggnog Chai tea lattes this time of year that are to die for. This sounds great! Love the idea of adding a simple syrup. Would be awesome with almond flour! Thank you! There are so many syrups that can be added, too, so the flavors are endless. I am glad you like this idea. It is great in small cans to make individual cakelettes and then you can vary each one. Beth, you are killing me with these cakes! I guess I’ll be going to the market again tomorrow before my baking extravaganza.